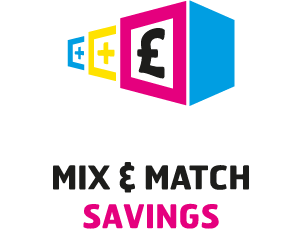 Our mix and match savings are designed to help you get the best possible value from us. We fix the problem with standard bulk discounts and deliver the best price on all of your eCommerce essentials – the more products you buy with us, the more you save with us, no matter what mix of products in your basket; it’s as simple as that. We reward you with savings of up to 49% when you order more. Our customers save hundreds of thousands of pounds every year by optimising their order size and mixing and matching their savings across our entire product range. You can try it yourself by increasing your product quantities in your order and watch the prices for every single product in our range get smaller, and savings get significantly bigger as you add more. We offer price breaks at 2, 5, 10, 20, 40, 100 & 200 boxes. Remember if you’re already buying some of your supplies with us, this discount rate you typically achieve is available on over 2000 other products in our range - so browse through our ranges to find out what else you could save on. As well as saving you money, we’re doing our bit for the environment too. Larger orders mean less frequent deliveries, so by rewarding such orders with big discounts, our Mix and Match savings help you, and us, cut down on the total number of deliveries we send a year, and dramatically reduce our impact on the environment.